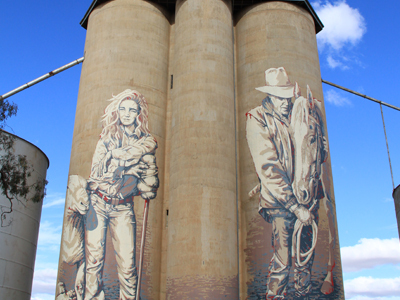 Chances are Victoria’s Silo Art Trail, established in 2016, is unlike any other gallery you’ve seen. 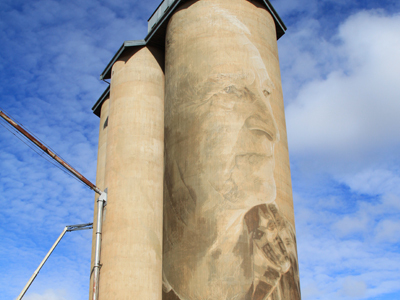 Taking a couple of hours to view in full, it features portrait murals on grain silos at six tiny towns dotted along the state’s wheat belt. This is extreme art, with many of the works a neck-stretching 30 metres high. Since the Trail opened with support from both the Victorian and Federal Governments, Yarriambiack Shire Council, international street art agency Juddy Roller and GrainCorp, it has been written up in travel guides such as Lonely Planet and lured visitors from around the globe. The upshot? Struggling towns lining the Trail have experienced a 30 per cent spike in international tourism numbers. Transforming the towers into art is a world away from their initial use. The GrainCorp silos date back to the 1930s and were originally built to store grain during harvest before being loaded onto trains to be transferred to port. As farming practices have modernised, these smaller facilities that typically stored around 10,000 tonnes of grain have given way to larger primary sites typically around 150,000 tonnes. These massive blank canvasses have provided a uniquely Australian opportunity to tell the story of these small towns and life in rural Australia. 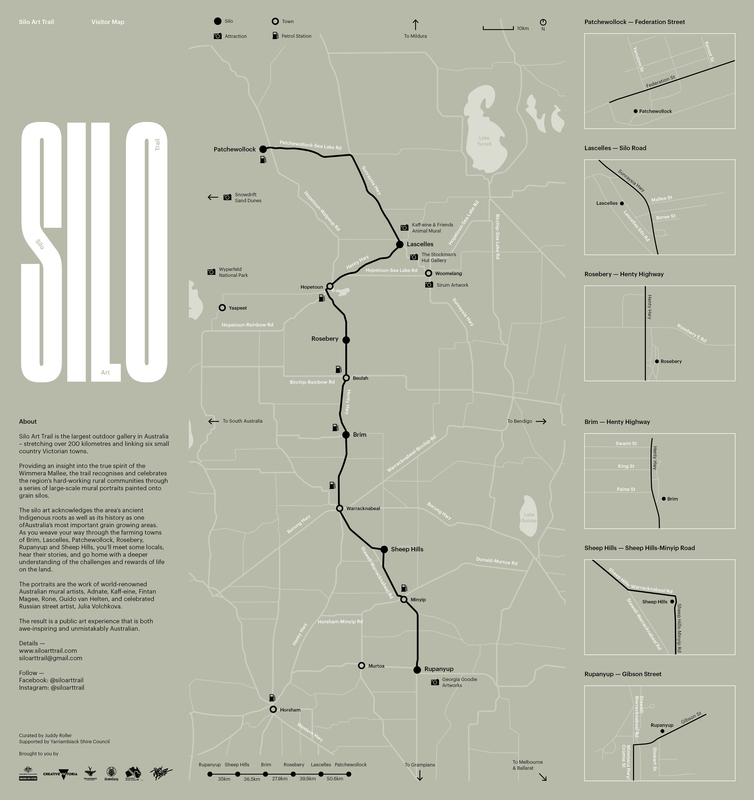 Download the Map from the Silo Art Trail website. From Melbourne, the closest silo to visit is at Rupanyup. It’s about 300 kilometres north-west of Melbourne – a 3.5 hour drive. Russian street and graffiti artist Julia Volchkova is the first female invited to paint for the Trail. Her mural is inspired by the Rupanyup Panthers Football and Netball Club, alluding to how sport can unite young people in rural towns. Painting on steel, Julia’s intention is for her black and white work to communicate a message of hope for the future. Drive 25 minutes to Sheep Hills. 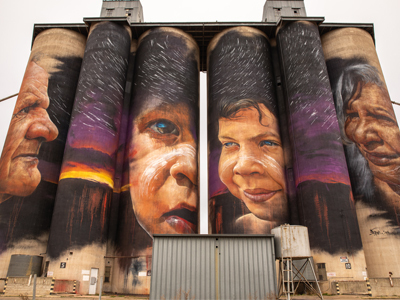 On this circa 1938 GrainCorp silo, Melbourne artist Adnate pays homage to the area’s Indigenous cultures by portraying Wergaia Elder, Uncle Ron Marks, and Wotjobaluk Elder, Aunty Regina Hood and children Savannah Marks and Curtly McDonald. Passing wisdom from one generation to the next is a focus. Drive 25 minutes to Brim. 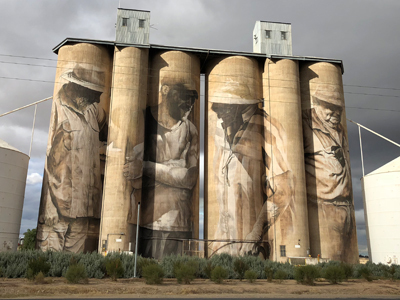 Painted in December 2015 by Brisbane’s Guido van Helten, this was the first GrainCorp silo commissioned for the Trail and showcases multiple generations of a farming family in the Wimmera Mallee. Drive 20 minutes to Rosebery. Here, Melbourne artist Kaff-eine – who also has murals in Germany, France, the US and the Philippines – references a young female sheep farmer (a nod to the farming of the future) and an Akubra-hatted Mallee farmer with his horse. Drive 25 minutes to Lascelles. 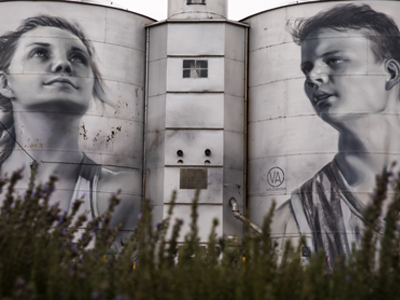 Melbourne street artist Rone spent two weeks painting these concrete silos depicting Lascelles born-and-bred wheat farmers Geoff and Merrilyn Horman, whose families have farmed locally for four generations. The couple married in Lascelles in 1967 and with their two sons they continue the family wheat business. By adding water to his paint and using a muted palette, Rone achieves a distinctive transparent style. Drive 35 minutes to Patchewollock. 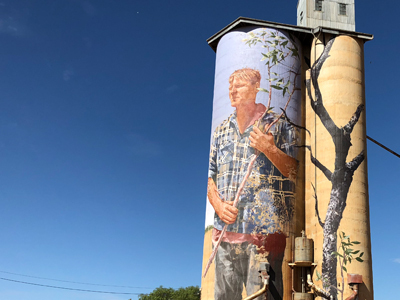 Brisbane’s Fintan Magee painted local farmer Nick ‘Noodle’ Hulland for this silo commission in October 2016. The choice of Noodle was both practical and symbolic: his slim physique fit the two narrow GrainCorp silos and he had a classic farmer look, right down to the sun-crinkled skin and the faded flannelette shirt. A full-time muralist dedicated to making art accessible to isolated communities and the general public, Fintan’s work has also appeared in Norway, Portugal, the Netherlands, Italy and the Ukraine. Common themes are climate change and migration as well as environmental issues.